According to his military service records, William M. Duncan was a 25 year old "Merchant" residing at Princeton in Gibson County, Indiana when he enlisted on August 9, 1862 into what became Company A of the 80th Indiana. William was mustered into the Union Army at the rank of 2nd Sergt. for a 3 year term of service on September 3, 1862 at Camp Gibson near Princeton, Indiana. At that time he was recorded as having been born in "Dauphin Co. Pa." and being "5 feet 9 inches" tall, with "grey" eyes, "brown" hair and a "fair" complexion. Two days later Sergt. Duncan was commissioned by Indiana Governor Oliver P. Morton as the new 2nd Lieutenant of Co. A. This made him third in command of the company after 1st Lieut. Jesse C. Kimball and Capt. Charles G. Brownlee (its commanding officer). All three were new to their ranks and positions. Lieut. Duncan filled the vacancy created when 2nd Lieut. Brownlee was promoted after the company's first commanding officer, Capt. George T. Simonson, became the 80th's Major (third in command of the regiment). 1st Lieut. Kimball had been the 1st Sergt. of Co. A before being commissioned to replace 1st Lieut. William P. Welborn who had been promoted to be the 80th's Assistant Surgeon. In November 1862 acting 2nd Lieut. Duncan served as acting Brigade Adjutant General (AG), a position of very considerable responsibility. From January through October 1863 Lieut. Duncan was listed as "Present" with the 80th. In February 1863 Lieut. Duncan's immediate superior, 1st Lieut. Kimball, resigned his commission and left the Army. The vacancy created was filled by promoting Sergt. Henry C. Jerauld of Co. A. On May 26, 1863 William was finally discharged as a Sergeant and mustered in as a 2nd Lieutenant, in response to Special Order No. 2 by Major General Ambrose Burnside (he of the famous sideburns). Even then William is recorded as not being paid as a 2nd Lieut. until October 31, 1863. On November 6, 1863 Lieut. Duncan was listed by the 80th as "Absent" and "ordered to Indianapolis Ind. for recruiting service" by "Maj. Gen. Burnside." In Lieut. Duncan's service records is a note dated December 19, 1863 from the Provost Marshal's Office for the 1st District of Indiana (where the 80th's soldiers were from) requesting railroad transportation from Evansville Ind. to Princeton for Lieut. Duncan. Lieut. Duncan was listed as still being "Absent" in March 1864, when Lieut. Duncan's superior, Lieut. Jerauld, resigned his commission, left the Army, and was replaced by Sergt. William Archer of Co. A. On April 13, 1864 Lieut. Duncan was commissioned by Governor Morton to be the new Captain of Co. A, to fill the vacancy created when Capt. Brownlee resigned and left the Army (the company's 2nd Lieut. position was then left vacant for the remainder of the 80th's service). Lieut. Duncan returned to the 80th on May 6, 1864, along with 1st Lieut. Eli P. Bicknell of Co. C, 1st Lieut. John T. Melton of Co. B, 1st Lieut. William H. Clements of Co. G, and 1st Sergt. Enos H. Kirk of Co. E. The regiment was then in northern Georgia, taking part in the opening actions of the famous 4 month campaign led by US Major General William T. Sherman to capture Atlanta Georgia. Early in that campaign, the 80th took part in the bloody fighting at Resaca, Georgia, on May 14, 1864. There it suffered 26 killed and 100 wounded out of the 270 men who were ordered to take part in a doomed charge against entrenched Confederate troops. This was a 47% casualty rate, one of the highest of any Federal unit in the battle. Two of the casualties were Capt. Duncan, who wounded, and his second in command, Lieut. Archer, who was killed. This left Co. A without any officers and under the command of a Sergeant. In Capt. Duncan's service records is a Medical Certificate dated May 27, 1864 stating that he had received at Resaca "a severe gun shot flesh wound of the parietes of the abdomen, left side" and would be unfit to resume his duties for at least 20 days. It is believed that this certificate was issued while he was in an Army Hospital in Nashville, Tennessee. Also in his records are three related documents. The first is a handwritten letter by Capt. Duncan referencing the medical certificate and requesting a 20 day leave of absence to return home to Princeton to recuperate. The second is a June 13, 1864 letter written from Princeton by Doctor W. W. Blair stating that the Captain's wound "though healing nicely" would "render him unable to return" to the 80th for at least another 20 days. Third is another letter from Dr. Blair dated July 2, 1864 stating that Capt. Duncan was still "unfit for duty" and required another 20 days' leave. While Capt. Duncan was away Sergt. 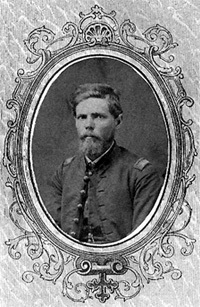 Jonah G. Tichenor of Co. A was commissioned on July 1, 1864 as the company's new 1st Lieutenant. On August 14, 1864 "near Atlanta, Ga." 2nd Lieut. Duncan was finally mustered in as Captain, retroactive to May 10, 1864. There are also references that indicate he was enrolled as Captain on July 1, 1864 at "Big Shanty, Ga." and on May 11, 1864 at "Rocky Face Ridge, Ga."
In August 1864 Capt. Duncan was listed by the regiment as being "Present sick" and from September 1864 through May 1865 he was listed as "Present" and serving as its "acting R.Q.M." (Regimental Quarter Master, the officer responsible for the unit's equipment). In this role Capt. Duncan was temporarily taking the place of 1st Lieut. Thomas M. Brown. The war ended in April 1865 with the surrender of most of the remaining Confederate forces. Capt. Duncan and the rest of his company were honorably discharged from the Army on June 22, 1865 at Salisbury, North Carolina when the regiment was disbanded. For more about Capt. Duncan's experiences during the war, click the 80th History link below to read what happened during for the months he was present with the unit. If you have additional details about him that you would be willing to share, then please contact Scott C. Meeker using the link below. Sources: Personal diary of 1st Lieut. Isum Gwin of Co. D, 80th Indiana (Georgia, May 6, 1864); Civil War Compiled Military Service Records by Office of Adjutant General of the United States (Washington, DC) and Regimental Descriptive Rolls, 1861-1865, Volumes III, IV, and VIII, Report of the Adjutant General of the State of Indiana (Indianapolis, Indiana, 1866).